The Portsmouth Harbour Ryde ferry route connects England with Isle of Wight. Currently there is just the 1 ferry company operating this ferry service, Wightlink. The crossing operates up to 24 times each day with sailing durations from around 22 minutes. Portsmouth Harbour Ryde sailing durations and frequency may vary from season to season so we’d advise doing a live check to get the most up to date information. Very professional and a fast crossing, just what we wanted. Took the passenger ferry to Ryde from Portsmouth. Only 30 mins but the craft was tidy and crew friendly. Only negative is finding the ferry offices (Portsmouth) especially as construction works meant any signage was not very clear. However still enjoyed the experience. The Ryde side was good bt remember the 1 mile walk along the pier great in good weather. "Portsmouth to Isle of Wight"
I recently travelled from Portsmouth Harbour to Ryde Pier, Isle of Wight by ferry (on foot, with the catamaran). I must say, what a lovely trip indeed. It only took about 22 minutes, which is a pretty quick time across the Solent. It was my first time. The scenery was beautiful, the ferry was nice and the crew on board were excellent, making the whole experience of my trip very pleasant. 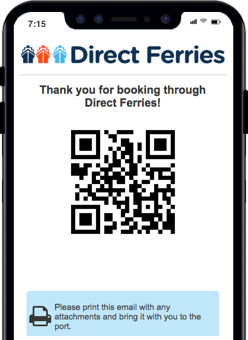 I will travel with Direct Ferries again, as the trip was value for money. I had a great crossing no problem with ferry would use again . I had a good time along the ride. Ferry crossing was brilliant booking on line was a nightmare. My first time of getting a ferry on my own the staff was really helpful and it was very well organised. The English city of Portsmouth is located on the south coast of England, in the county of Hampshire. It is the UK's only island city and is situated around 100 km to the south west of London and 30 km to the east of Southampton. The city's long history is inextricably linked to the sea. It is home to the oldest dry dock in the world still in use and also to famous ships such as HMS Victory, Admiral Lord Nelson's flagship, the Mary Rose and HMS Warrior. The city is also home to the Royal Marine Commandoes and to a naval base. The city's port is one of the best connected ports in the United Kingdom, serving nine different destinations. To the south of the Naval Base, you will find the Isle of Wight (Ryde) Passenger Ferry Terminal. The Continental Ferry Terminal is served by ferry services to Le Havre in France and Bilbao in Spain. 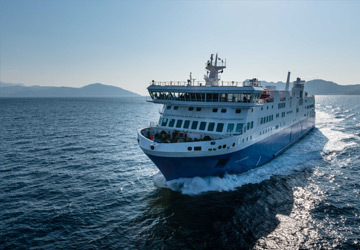 There are also daily crossings to Cherbourg, Caen and St Malo in France, St Helier in Jersey, St Peter Port in Guernsey and to Ryde on the Isle of Wight. Ryde is the largest town on the Isle of Wight and is often referred to as the "Gateway to the island" due to its prominent position along the shores of the island and its hovercraft and passenger ferry links to the English mainland. Visitors to the town enjoy its lovely sandy beaches which stretch the length of the town, its boutique shops, museums and galleries. As the island's largest town it comes as no surprise to learn that it is also the venue for some of the island's largest annual events. For example, every August bank holiday thousands of scooter enthusiasts descend upon the town for the Isle of Wight Scooter Rally, and just a few weeks later the town's esplanade can be seen draped in classic cars for the International Classic Car Show. Ryde is also home to one of the United Kingdom's oldest carnivals which usually takes place at the end of the summer and forms the end of the Isle of Wight carnival season which travels all over the island. Ryde’s collection of late night bars and clubs also tend to make it one of the most popular spots for nightlife.